That's sad to see things going that way. We could really use a better winter here next year. Ski hills, bars, snowmobiling, etc are all taking a beating the last two years over winter. I didn't think we'd get three bad ones in a row. SCRIPPS ENSO forecast for the Summer months...this model is notorious for running colder than other models. I remember this time last year it was forecasting a super Nina for last Winter. Not that it can't happen (3rd turd), but IF we could get a weak Nino to true neutral (kinda what Scripps that Tom just posted shows) we "should" do well. Long ways to go ofc. Oh good, there's some hope. I was looking over a university page, I forget which one, and they said neutral was the best snow for Chicago area historically. 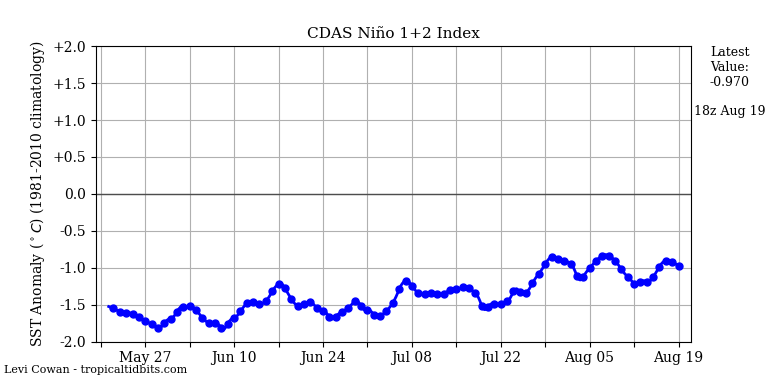 CanSIPS models suggesting a weak Nino this summer which isn't much of a surprise as most models are thinking the same. Looking out farther, a basin-wide Nino develops, but the warmest waters are central-based. This will be the key to winter weather fans next year as the new LRC develops in Oct/Nov. Nobody knows what this Summer will bring. Mother nature will do what eva it wants. Last year the models were advertising more snow and colder temps and we ended up with a mild Winter. That goes ta show ya! Peace Ya'll. Sorry if it's too huge of an image, pretty interesting stuff, no sun spots. This year has been abnormally low in sun spot activity, except for what has erupted recently. It'll be interesting what happens throughout this year. Wow. That's extremely far east. If that one verifies, kiss next winter goodbye for sure. Response, ENSO 1.2 falling off a cliff! However, it has ticked up the warmth of the waters. Getting close to Super Nino status during next Winter. It is the warmest running climate model so we see how this all plays out in the end. Isn't a super nino super bad for winter? 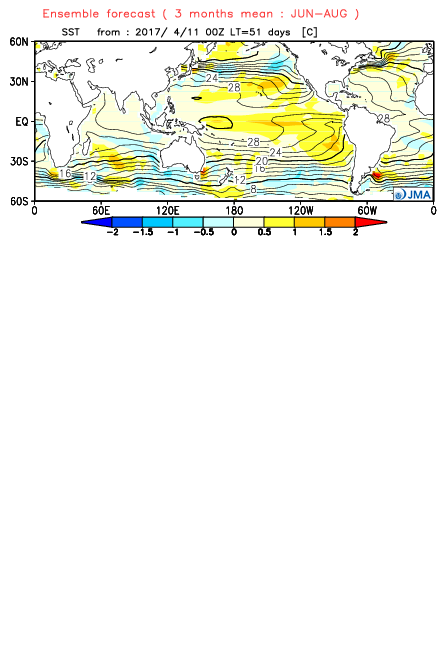 Depends, JAMSTEC isn't necessarily looking that bad as far as the warm/cold pools placement in the PAC. I think its running a bit warm. Indeed, I don't get excited till I begin to analyze how the new LRC evolves. I'd imagine with the SOI crash currently in the -30's over the last few days, we will see some jump to the ENSO warming. However, current anomalies are not all that impressive. CFSv2 now out to October and sure looks like the Euro in terms of placement of the warmest waters in the central PAC...meanwhile, over in the N PAC waters are cold near Hawaii. I think we will see a very weak El Nino this fall. +0.5-+0.6 in the 3 and 4 region. I'm hearing the CFSv2 re-initialized and has backed off the strength of the Nino for this summer and heading into the Fall. Recent runs barely showing a weak Nino. If trends persist through mid summer, a weak Nino would not be bad at all. 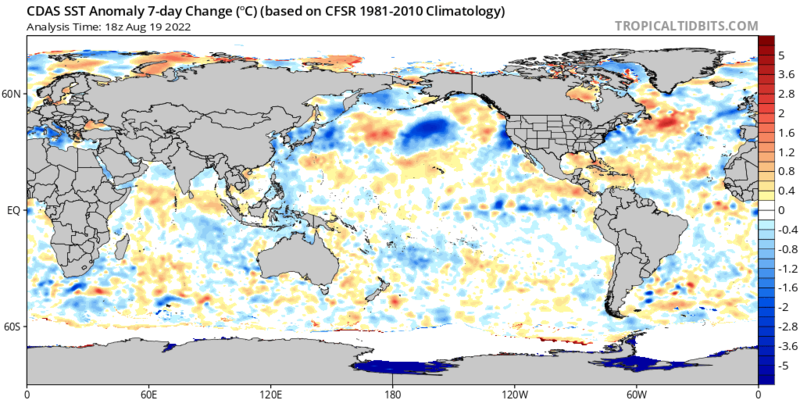 Central PAC subsurface waters still coolish which will prob retard any warming in the foreseeable future. I'll be happy if next winter is just really cold, don't need the snow but I would love it. After the last two, my standards for a happy winter have fallen massively. '13-'14 seems like a distant memory! Wouldn't mind seeing a '76-'77 scenario next winter. Seeing some analogs and patterns in the PAC showing up. So you like 10 below zero, a -40 W.C., and no snow on the ground? The shoulder season is normally a difficult time for modeling as they struggle what to do with the SST's in the PAC. Not only has the CFSv2 backed off a moderate strength El Nino for the summer, but it's barely showing a weak Nino now. 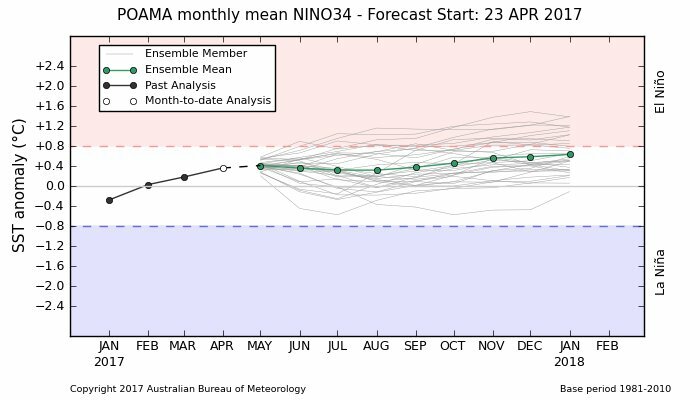 Moreover, the POAMA climate model has backed off it's Nino-look from earlier in the month. Took a look at the CFSv2 monthlies and it's showing some crazy weenie runs for next Autumn/Winter. I really wonder if this Nino even reaches moderate strength like earlier runs were showing. We'll see. Trends for a much colder cold season overall are on the table if the warm/cold pools align just right in the PAC. It's not ideal but at least they can make snow and it'll be good snow. Once it starts getting warm and the man made snow starts freezing and thawing it ends up horrendously bad. Man made snow likes to melt down into a giant ice cube as opposed to melting and flowing away. Snowboarding this year was pretty bad. The people at the hill did an amazing job given what they were dealt, but it was still pretty lousy. If we get -10 they can make a ton of really nice snow. Something I didn't even get this year from snow guns. I think we'll definitively have a good idea whether or not we see a Niño within the next month or 45 days for sure. If the first round of attempts at strengthening fail in the next few weeks, any nino of significance looks relatively unlikely. If anything, I think a weak Nino is on the table. A moderate one is trending less likely as it stands now. I'm interested to see what tonight's new monthly CanSIPS run shows. Hot off the press is the latest CanSIPS monthlies and it suggests a mod/strong Nino for this Summer heading into the Fall. I think it is initializing much to warm off the South American coastline and I don't see the waters being that warm in the ENSO 1.2 region. 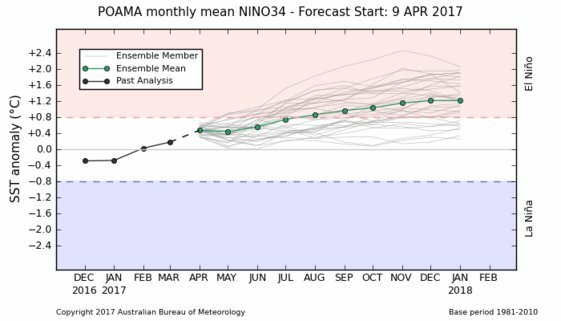 In result, I think this model may be an outlier of being to robust with the Modiki El Nino. Interesting, saw this post by Ryan Maue, noting the El Nino signature in May is now gone with the wind...unfavorable trade wind??? It'll be interesting to see what the new May monthlies run suggests later this month. DJF? Did you mean to show a 3rd map? Sorry, fixed...haven't had my cup off coffee yet! Woke up at 5:45am this morning...crashed out like around 9:30 last night bc I was super exhausted from 2 hikes up in the mountains of Payson, AZ. I did close to 12 miles of hiking up in 6,500 - 7,500ft elevation!